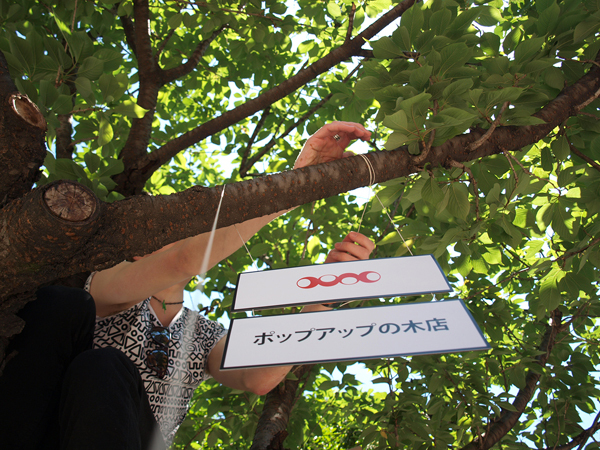 A young designer who moved from London to Tokyo to a tree! Duncan Shotton was born in London, he studied design and then he moved in Tokyo where he had the beautiful and amazing idea to open a shop on a tree! I had the great opportunity to exchange some words with him, let’s go to see what he tells about! 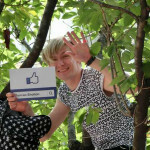 My name’s Duncan Shotton, I’m a British Designer in Tokyo, Japan. I’m principally a product designer, but have experience in packaging, graphic, user-interface and space design. Why did you decide to “open” your shop on a tree? I sell some of the products I’ve designed via my website / online shop. I’d love to have a physical store too, but it’s expensive, time-consuming, and I’d probably want to re-design it all the time. So I was really keep to open a pop-up shop. One day, I noticed a beautiful little tree at the end of a long string of lovely shops. 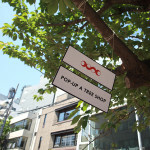 It was a bit like there could be a shop there, but instead there was tree, and that’s when I came up with my ‘POP-UP A TREE SHOP‘ idea. Why on a tree and not on something else? What has you inspired? I climbed a lot of trees and built a lot of treehouses when I was younger, it was easy to imagine how the shop could work. Is there a link for you between design and nature? If yes, could you explain? Not always, but I do like clouds. Which is the feeling to stay at the open air and not closed in a box? Does this expand your creativity too? What is the approach of your clients? 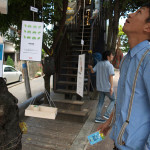 Of course is very peculiar to see a person on a tree who wants to sell something, which approach was the best? Or can you just tell me the funniest story that happened to you with one of your clients? Normally, when Japanese people see my design work their first word is almost always “kawaii” (cute). In the case of the tree-shop however, it was replaced by “bikkurishita” (surprised/shocked). Couples would walk below, one would see me and explain to their partner and the partner would look around with a ‘what are you talking about’ face. One of my customers was an elderly Japanese lady that was holding a tiny turtle wrapped in a sock. She said she was taking it for a walk. Have you ever thought to build a real treeshop? Which are the opening hours of your shop? And which is the address for the people who want to come to visit you? As is the nature of pop-up shops, they pop-up, then pop-down again, that’s what makes them exciting. This one was on Cat-street, Harajuku, Tokyo and only lasted a day. 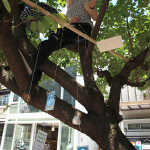 I sat in the tree and used a little wooden tray on a pulley to winch money up and products down. I dangled products and information from strings and had a toy fishing rod to do business card exchange. Do you stay always on the same tree or you just move from the city day by day? Have you ever thought to travel on the trees of the whole world? It would be lovely! I am already planning my next pop-up shop, and will be announcing further details on my facebook and twitter accounts verysoon. Please like and follow! Thanx Duncan for your words, I think you are a genius and I hope to have your news very soon, because I love your story and I want to know your next stop! If you too are interested knowing Duncan’s next destination or just follow his ideas, just visit his facebook’s page, take a look at his website or just tweet him!